Chen, C.-E., Go Greener with Passive Sampler and beyond. (2015) J Environ Health Sci 1(1): 1-2. © 2015 Chen, C.-Er. This is an Open access article distributed under the terms of Creative Commons Attribution 4.0 International License. Thousands of chemicals are commercially produced throughout the world and the total number increases each year. Environmental monitoring is required to access their release to and exposure and effects in the environment. Traditional sampling approaches such as grab and automatic samplings are time/cost consuming and labour intensive. While passive sampling approach can save lot of time and cost in terms of giving a time weighed average (TWA) concentration. Herein we gave an introduction of passive sampler and briefly discussed the necessity of passive sampler and what information that passive sampler can offer. Then we concluded that passive sampling can be a greener way in environmental monitoring and should be paid more attention to particularly for the emerging pharmaceuticals and personal care products (PPCPs). Passive sampling is a sampling technique based on free diffusion of analyte molecules from the sampled medium to a collecting medium, results in a difference in chemical potentials of the analyte between the two media. The word 'passive' contrasts to traditional 'active' sampling methods (which need power to run, such as grab sampling -Grab and automatic sampling with automatic sampler - Auto), because no power is needed during sampling process. Passive sampler usually consists of a filter and/or diffusive layer and a receiving layer, some with extra housing such as DGT or without such as SPMD. Why Do We Need Passive Sampler? Thousands of chemicals are commercially produced throughout the world and the total number increases each year. Unfortunately, many of these anthropogenic chemicals, such as heavy metals, persistent organic pollutants (POPs) and the emerging pharmaceuticals and personal care products (PPCPs), are released into terrestrial and aquatic ecosystems. It is necessary to monitor pollutants and to further understand their fate and behaviour in the environment, to satisfy the requirements of legislative frame works and directives. Most of our aquatic monitoring programs rely on collecting discrete grab samples of water at a given time. However, this approach suffers not only from high costs, and are labour intensive (as I felt in the lab at late night), but also high uncertainty because of the natural variability in concentrations over time (Figure 1), or may not capture the most environmentally relevant concentration 'form' (i.e. not the truly dissolved, bio available fraction of the contaminants). 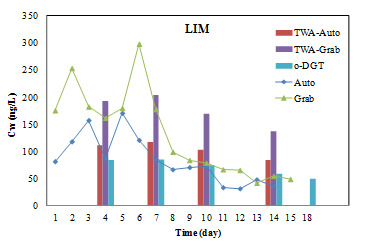 Figure 1: Comparison of passive sampling (o-DGT) with active samplings (Auto and grab sampling) for measurement of lincomycin (LIM). Passive sampling technique has many advantages, including 1) simplicity. No need pre-treatment of samples such as filtration for water since it can do this by the sampler itself and un attended operation (just leave in the water for some time). 2) low cost/time. It can be less than ¼ of the total cost for active samplings to get a reliable result as our study mentioned above shown. Because it gives an average concentration which needs several repeat samplings by Grab or Auto samplings, thus it saves a lot of time (I can go home earlier) and materials (like SPE cartridges and harmful solvents– so greener).And no need for expensive and complicated equipment and no power requirements (particularly compared to Auto) and 3) the ability to produce accurate results. It can give similar results as Auto sampling (which is the most reliable approach currently); both are better than grab sampling. Therefore, scientists have been thinking of designing, development and improvement of different passive samplers (such as SPMD, DGT and POCIS) during the last four decades. What Can Passive Sampler Tell? Passive sampling can give us a time weighted average (TWA) concentration rather than an instantaneous concentration. This is particularly advantageous for some environment with varying concentrations over time. For example, if some naughty factories discharge their waste during night when the most common grab sampling occurs, the grab sampling might tell you no pollution, however, passive sampling will tell you that there is pollution. Environmental monitoring is the initial purpose of passive sampling and indeed is the main application in current studies in environmental field. However, passive sampling can do more than that. With passive samplers, some environmental processes (interactions with DOM, sorption/desorption in soil/sediment), bioavailability (such as DGT for metals) and (eco-) toxicity of chemicals can be understood or assessed in situ, thus it is also a very useful scientific tool. And this is particularly needed for the emerging PPCPs. Human has been thinking of a green or sustainable lifestyle, people from different working areas can have their ways to be sustainable. While passive sampling can be a greener way in environmental monitoring field since it can save lots of time and cost. So why not go greener with passive sampling, and remember it can tell you more. Note: views expressed in this editorial are those of the author and not necessarily the views of the Ommega publisher. 1. Gorecki, T., Namiesnik, J. Passive sampling. (2002) Trac-Trends in Analytical Chemistry 21(4): 276-291. 2. Chen, C.-E. Zhang, H., Ying, G.-G., et al. Evidence and Recommendations to support the use of a Novel Passive Water Sampler to Quantify Antibiotics in Wastewaters. (2013) Environ Sci Technol 47(23): 13587-13593. 3. Lohmann, R., Muir, D. Global Aquatic Passive Sampling (AQUA-GAPS): Using Passive Samplers to Monitor POPs in the Waters of the World. (2010) Environ Sci Technol 44(3): 860-864. 4. Levy, J. L., Zhang, H., Davison, W., et al. Kinetic Signatures of Metals in the Presence of Suwannee River Fulvic Acid. (2012) Environ Sci Technol 46(6): 3335-3342. 5. Chen, C.-E., Jones, K. C., Ying, G.-G., et al. Desorption Kinetics of Sulfonamide and Trimethoprim Antibiotics in Soils Assessed with Diffusive Gradients in Thin-Films. (2014) Environ Sci Technol 48(10): 5530-5536.